With a narrow, flexible design and excellent corrosion resistant properties, this 8mm 6×24 galvanised wire rope will repel rust and be a great option for lashing loads in maritime settings where moisture is always present. While you will not normally find this rope used in lifting tasks, its capacity of 3,580kg is still solid, especially given its modest 8mm diameter. 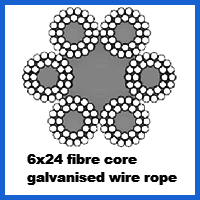 There are much sturdier ropes in the rest of our galvanised range, although few are as flexible as this 6×24 product. This is due to the use of fibre in conjunction with steel wires, with both the core of the rope and all six bundles using this malleable material. The upshot of the construction is not just flexibility, but also an increased susceptibility to crushing forces. The longevity of this rope is lessened compared with other wire rope options, but all this really means is that you have to be a little more vigilant during maintenance checks. At Rope Services Direct you have the option to order 8mm 6×24 galvanised wire rope in any length, while also being able to add the components you need to create a one of a kind assembly. Thimbles, ferrules and lots of other fittings can be chosen and installed by our experts. Reach RSD on our sales hotline by dialling 01384 78004 and asking our team any questions you have. Use our online contact form for an unobtrusive chat via email. 8mm 6x24 Galvanised Wire Rope Overall rating: 5 out of 5 based on 6 reviews.